This is the second post in our series on mid-size cities, which offer great value for family vacations. Tempe, AZ is a great travel destination, especially September through April when temperatures are more mild. Though, the region offers much even in summer! The Phoenix Zoo offers an Arizona Trail, allowing guests to observe species native to Arizona including javelinas, rattlesnakes and more. “Monkey Village” allows guests to enter the monkey habitat without being separated by fences, one of the few zoos to offer such an up-close experience for spider monkeys. Beyond viewing animals, guests can also ride camels, feed the giraffes, brush goats, and even ride a zip line. With so much available, the Phoenix Zoo is an experience the whole family will enjoy. Near the Phoenix Zoo, Hole in the Rock offers an easy trail with incredible views. Guests who take the 10 minute climb are rewarded with great views of Papago Park and the surrounding area. The climb is easy, according to reviews, and admission is free. Take a picnic dinner and enjoy the evening views (and cooling temps as the sun sets). This indoor facility offers fun for the whole family, especially families of tweens and teens. Guests can enjoy arcade games, a gravity ropes course, bowling and more. Stretch your vacation dollar with bonus cash added on when you purchase online before you go. Parents, the restaurant areas offer quieter space to relax while the kids play! Tempe is a college town and The Mill Avenue District, downtown, reflects that vibe! Restaurants, like NCounter, provide a relaxed atmosphere and a diverse crowd. Tempe vacationers can enjoy activities on the ASU Tempe Campus including sporting events, Broadway-style theater performances, art exhibitions or a scientific collection/planetarium show. These activities, which make ASU an attractive college choice for students, also provide affordable vacation options for families. Plan to travel to Tempe, AZ during a festival and enjoy bonus fun, much of it free. •Festival of the Arts is featured in March and December, featuring visual and performing arts, food vendors, and other exhibits. •Summer Ends Music Festival, while not free, offers three days of fabulous entertainment at Tempe Beach Park each September. •Arizona Aloha Festival features fabulous Hawaii every March. Enjoy live performances, island food, Hawaiian ukelele music and more. For more information on festivals and events during your vacation, check out Tempe Tourism’s calendar of events. 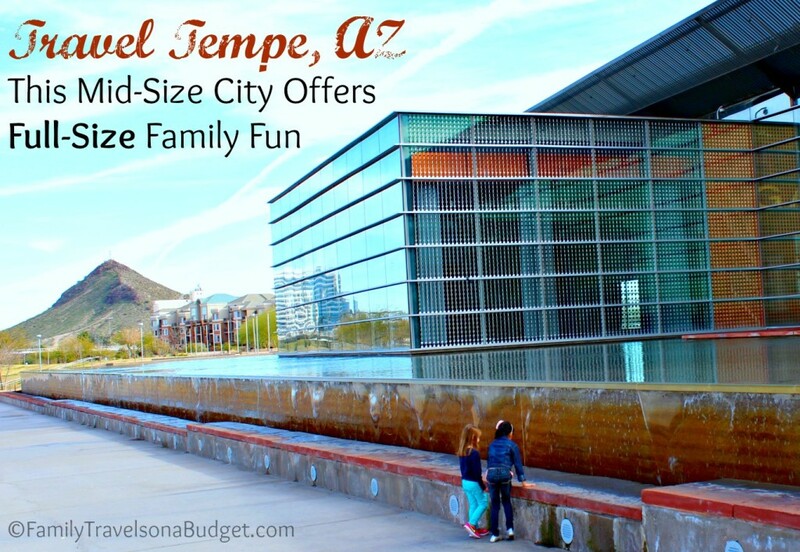 Beyond great family friendly attractions and events, when you travel to Tempe, AZ, you’ll enjoy reasonably priced lodging, ample city parking, a walkable downtown and sunny weather! Enjoy all Tempe has to offer and use it as “home base” as you explore everything Arizona has to offer! If you’re considering a family adventure in America’s southwest, consider Tempe. Want to learn more about Tempe travel? Tempe is one of my favorite mid-size cities in the country. Combine friendly people, great weather (especially spring and fall), unique Mexican inspired dining, and a wide variety of outdoor activities, and a vacation in Tempe, AZ just makes cents…. errrrrr…. sense! Have you been to Tempe? What do you like best about travel to this area? (sent once weekly) and we’ll send them right to your inbox. looks wonderful–Love that a lot of it FREE! So great when you can get information about these gems from someone who’s been there! Pam, I enjoy getting to share these destinations through the blog. It’s fun getting to share what I see! I hope you always find my reviews and recommendations helpful. Andi, it’s a lot of fun… though I confess, I don’t plan to visit in August. Too hot! I would love to take my kids to AZ sometime. I would love to take them to visit as many states as possible before they graduate. We never made it to the Rocky Mountain states or the Pacific Northwest with our kids, but we got most of the south, midwest and east. Introducing them to different cultures and traditions, even within the US, helped them think more broadly and appreciate how alive history is (at least I think it did). I hope you and your kids make it to all 50 states before they graduate! Sounds very interesting! Great post! Thanks, Leelo. It’s a great place to visit! This sounds heavenly. I especially like the family festivals – my family would have a blast! I’d love to get back there for a festival later this year. Looks like a lot of fun things to do. I love that first picture. Thanks, Michelle. My daughter looked so tiny in front of that water feature. The whole waterfront is amazingly beautiful.